Personalised tea towel featuring an adorable Love Bug motif and embroidered with names or a little message to make a truly special gift. Personalised tea towel featuring an adorable Love Bug motif and embroidered with names or a little message to make a truly special gift. Unique and useful gift idea for men or women even for a wedding anniversary or Valentines Day! Choose the Text. 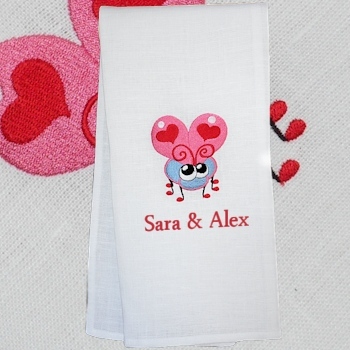 Personalised tea towel featuring an adorable Love Bug motif and embroidered with names or a little message to make a truly special gift. 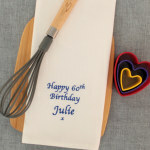 Unique and useful gift idea for men or women even for a wedding anniversary or Valentines Day! Choose the Text. Choose the thread colour and font style. We will produce your gift especially to order and ship your unique gift to you or your chosen recipient. You can have any names or little message you want! This motif is great for Anniversaries, A Wedding Gift, and holidays like Valentines! You may choose a thread colour for the text and we offer two different text styles, fancy script or print (our example picture has the text in print font and red thread).